08 - Hybridism 08-05 - Causes of the sterility of first crosses and of hybrids 10 Causes of the Sterility of first Crosses and of Hybrids. We may now look a little closer at the probable causes of the sterility of first crosses and of hybrids. These two cases are fundamentally different, for, as just remarked, in the union of two pure species the male and female sexual elements are perfect, whereas in hybrids they are imperfect. Even in first crosses, the greater or lesser difficulty in effecting a union apparently depends on several distinct causes. 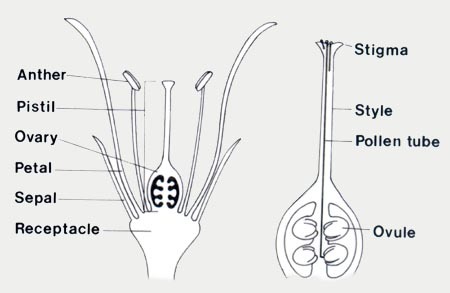 There must sometimes be a physical impossibility in the male element reaching the ovule, as would be the case with a plant having a pistil too long for the pollen-tubes to reach the ovarium. It has also been observed that when pollen of one species is placed on the stigma of a distantly allied species, though the pollen-tubes protrude, they do not penetrate the stigmatic surface. Again, the male element may reach the female element, but be incapable of causing an embryo to be developed, as seems to have been the case with some of Thuret's experiments on Fuci. No explanation can be given of these facts, any more than why certain trees cannot be grafted on others. Lastly, an embryo may be developed, and then perish at an early period. This latter alternative has not been sufficiently attended to; but I believe, from observations communicated to me by Mr. Hewitt, who has had great experience in hybridising gallinaceous birds, that the early death of the embryo is a very frequent cause of sterility in first crosses. 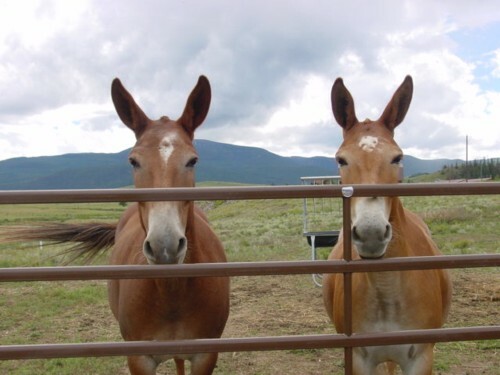 I was at first very unwilling to believe in this view; as hybrids, when once born, are generally healthy and long-lived, as we see in the case of the common mule. Hybrids, however, are differently circumstanced before and after birth: when born and living in a country where their two parents can live, they are generally placed under suitable conditions of life. But a hybrid partakes of only half of the nature and constitution of its mother, and therefore before birth, as long as it is nourished within its mother's womb or within the egg or seed produced by the mother, it may be exposed to conditions in some degree unsuitable, and consequently be liable to perish at an early period; more especially as all very young beings seem eminently sensitive to injurious or unnatural conditions of life. In regard to the sterility of hybrids, in which the sexual elements are imperfectly developed, the case is very different. I have more than once alluded to a large body of facts, which I have collected, showing that when animals and plants are removed from their natural conditions, they are extremely liable to have their reproductive systems seriously affected. This, in fact, is the great bar to the domestication of animals. Between the sterility thus superinduced and that of hybrids, there are many points of similarity. In both cases the sterility is independent of general health, and is often accompanied by excess of size or great luxuriance. In both cases, the sterility occurs in various degrees; in both, the male element is the most liable to be affected; but sometimes the female more than the male. In both, the tendency goes to a certain extent with systematic affinity, or whole groups of animals and plants are rendered impotent by the same unnatural conditions; and whole groups of species tend to produce sterile hybrids. On the other hand, one species in a group will sometimes resist great changes of conditions with unimpaired fertility; and certain species in a group will produce unusually fertile hybrids. No one can tell, till he tries, whether any particular animal will breed under confinement or any plant seed freely under culture; nor can he tell, till he tries, whether any two species of a genus will produce more or less sterile hybrids. Lastly, when organic beings are placed during several generations under conditions not natural to them, they are extremely liable to vary, which is due, as I believe, to their reproductive systems having been specially affected, though in a lesser degree than when sterility ensues. So it is with hybrids, for hybrids in successive generations are eminently liable to vary, as every experimentalist has observed. Thus we see that when organic beings are placed under new and unnatural conditions, and when hybrids are produced by the unnatural crossing of two species, the reproductive system, independently of the general state of health, is affected by sterility in a very similar manner. In the one case, the conditions of life have been disturbed, though often in so slight a degree as to be inappreciable by us; in the other case, or that of hybrids,the external conditions have remained the same, but the organisation has been disturbed by two different structures and constitutions having been blended into one. For it is scarcely possible that two organisations should be compounded into one, without some disturbance occurring in the development, or periodical action, or mutual relation of the different parts and organs one to another, or to the conditions of life. When hybrids are able to breed inter se, they transmit to their offspring from generation to generation the same compounded organisation, and hence we need not be surprised that their sterility, though in some degree variable, rarely diminishes. It must, however, be confessed that we cannot understand, excepting on vague hypotheses, several facts with respect to the sterility of hybrids; for instance, the unequal fertility of hybrids produced from reciprocal crosses; or the increased sterility in those hybrids which occasionally and exceptionally resemble closely either pure parent. Nor do I pretend that the foregoing remarks go to the root of the matter: no explanation is offered why an organism, when placed under unnatural conditions, is rendered sterile. All that I have attempted to show, is that in two cases, in some respects allied, sterility is the common result, in the one case from the conditions of life having been disturbed, in the other case from the organisation having been disturbed by two organisations having been compounded into one.